Book: From Sacrament to Contract - John Witte, Jr.
​In From Sacrament to Contract, John Witte Jr. offers a study of five conflicting models of marriage--Catholic, Lutheran, Calvinist, Anglican, and Enlightenment--and their social and political impact over the last thousand years. In so doing, Witte shows how we arrived at the notion of marriage as contract. "From Sacrament to Contract is a penetrating study of five conflicting models of marriage – Catholic, Lutheran, Calvinist, Anglican, and Enlightenment – and the impact on domestic legislation and organization over the last millennium. Rarely has the interaction of religious belief, law, and marriage been so incisively illuminated. This book is a touchstone for a new intellectual history of religion." "A tour de force, Witte’s book will be discussed for years to come. He masterfully surveys the many complex traditions of marriage in the West – as sacrament, as social estate, as covenant, as commonwealth – helping us to understand how we arrived at an ever more narrow notion of marriage as contract…Witte has placed us in a complex conversation with our collective and nearly lost heritage and for that we are all in his debt." "A fascinating tour through the legal, philosophical, and religious ideas that have shaped and reshaped Western thinking about the relations between men and women." "To my admiring amateur eye this volume represents two exceptional accomplishments. The first and greatest is its masterful elaboration of the original role of the Reformation in sculpting the marriage law that so recently has been disassembled by our courts and legislatures. 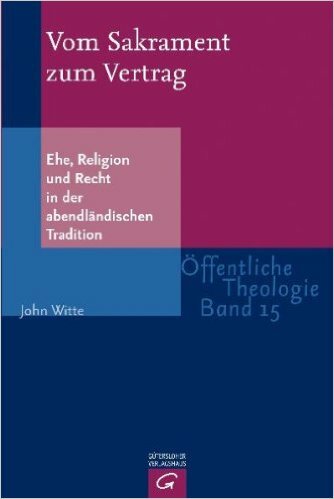 I know of nothing approaching the level of analytical clarity achieved here in tracing the transition from the traditional Catholic model to the three principal Protestant forms that in their turn were to be delivered to the mercies of the Enlightenment …The other great service is its clarification of the interface between these sources and contemporary marriage law …"
"Professor Witte’s wonderful book responds to what he argues is a crisis – the disintegration and marginalization of the West‘s store of wisdom about marriage and family, indeed the virtual cessation, except at the margins, of a genuine dialogue about marriage’s and family’s goods and goals and the means of their realization… Professor Witte lays out in splendid detail the range of values that were forward in the institution of marriage until Anglo-American law reduced marriage to a virtually bare instance of contract, no longer in service of community and a shared sense of human goods. Witte’s work is a summons to lawyers and theologians alike to begin again the painstaking work of devising doctrines and institutions that order human lives toward genuine human goods." "This is a superb history of Christianity and the family from the first century to the twentieth century…He has mastered an enormous amount of literature, and the bibliography is testimony to his range of research. To write such an interdisciplinary work and to do so with grace and clarity is an extraordinary achievement." "This is the rarest of books these days, one that delivers what the cover blurb promises. It is an informed, penetrating, and critical study of five Western models of marriage –Catholic, Lutheran, Calvinist, Anglican, and Enlightenment –and of the impact they have had on domestic law and organization in the past millennium. 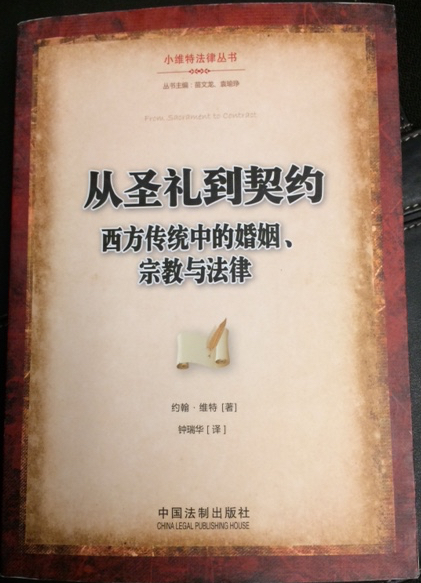 It is filled with eminently readable scholarship. Anyone wishing in years to come to speak intelligently of marriage in the West will have to consult Witte’s book… This brilliant book… This is, however, not a book to be read only by historians and antiquarians. It illuminates our collective heritage of religion, law, and marital structure. It should be obligatory reading for students, theorists, and politicians who would improve the present situation of marriage and family, and for those who would make their marriages productive in both society and church." "In From Sacrament to Contract Witte provides what is unquestionably the finest history of western marriage in the Christian epoch. He focuses on the theological and ethical models of marriage in the Catholic, Lutheran, Calvinist, Anglican, and Enlightenment contexts. Informed by a wealth of primary sources –many of which Witte has highlighted for the first time –the author shows how these models have directly affected domestic law and organization. There is simply no other treatise that conveys the history and cultural impact of Christian social thought in such a thorough and penetrating fashion." "His book should long be the standard reference for anyone interested in knowing how Europeans have sought to connect the personal and the public in the family life…Witte’s magisterial work of historical scholarship will be required reading for anyone who wants to understand the legal and theological “genetic code that has defined the contemporary family for what it is –and what it can be,” as Witte says at the end of his introduction." "John Witte’s book is a highly commendable and recommendable work, but not for the faint-hearted among us." "It is impossible, in a brief review, to do justice to the subtlety and depth of Witte’s book. In arguing for the dominance of these models in certain places and within certain traditions, Witte never tries to claim too much. Constructing models is a dangerous business, and leaves the author vulnerable to accusations of oversimplifying and ignoring inconvenient evidence. Witte is guilty of neither of these. For those who like their histories of marriage populated with actual wives and husbands, this will not be a satisfying book. Although Witte does include an occasional case study, his book is really about ideas. Those who believe that ideas do matter will find the book stimulating and helpful. With so many specialist studies of marriage in particular places and times now available, it is especially valuable to have such a book to guide us towards a coherent vision of this aspect of our past." "From Sacrament to Contract…will remain standard for some years to come… one of those rare works that combines ease of comprehension with extraordinary scholarly breadth. It is clearly the result of years of meticulous and original scholarship combined with careful and clear writing. It is a book that should be found in the libraries of all practicing clergy. It will help them in innumerable ways to convey the nature of the institution they are so frequently called upon to witness and bless and it will help them grasp the deep reasons for what is not so frequently called a crisis in the institution of marriage…Witte has written a superb book—one that makes an invaluable contribution to our understanding of the most basic of all social institutions." 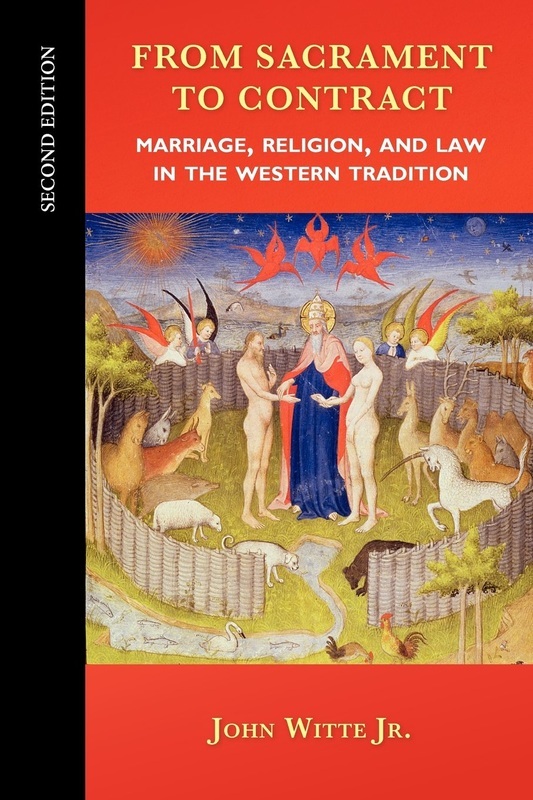 "It is a scholarly exercise in the history of ideas, demonstrating the interdependence of Western theological and legal traditions and how they have understood the institution of marriage. Witte’s source material includes hundreds of documents and court records; endnotes and references account for nearly a third of the book’s pages. He has done family scholars the enormous favor of organizing these archival sources into a highly readable and coherent narrative." "This is a book of thorough scholarship, truly written…in a style which never interferes with understanding, even by the lay reader in either of his areas of learning…Into the white hot emotions of the current political issues about marriage and family comes Witte’s careful, reasoned historical review…undertakes to identify how legal formulations and prevailing theological ideas have interfaced and affected one another." "An intelligent and comprehensive analysis of how four influential Christian traditions have shaped in the West the concept of and the laws that have governed marriage." "I would recommend this book solely on the basis of Witte’s treatment of Henry VIII’s marital troubles. It is simply the clearest, most engaging explanation of the subject I have ever read."